On March 1, 2006 Rev Swami Adhyatmanandji led a rally together with head of various religious organizations from Sardar Park to Gandhi Ashram, Kochrab, Ahmedabad for the noble cause of bringing awareness in the society of social crime of female feticide.Over a thousand people joined in support of this movement. It has influenced many NGO's as well as Government for launching this movement of ‘Beti Bachao'- “Protect daughters program"
Upon the sincere invitation of Brigadier Sarvesh Dangwal, Commandant Army Institute of Physical Training Swamiji visited Poona (Maharashtra) for three days "Man making and Character building program". 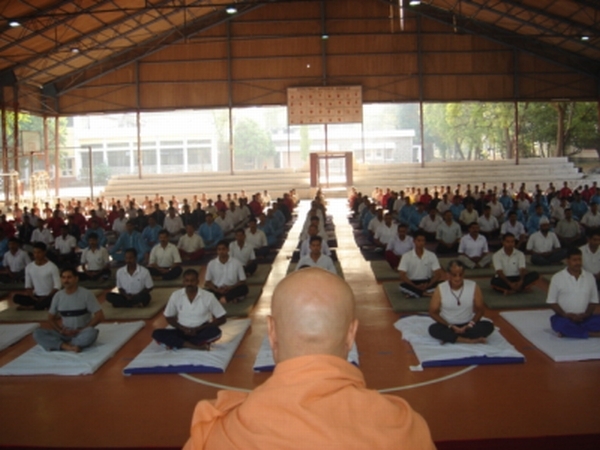 Here other than morning Meditation, Prayer and Yoga – Pranayama classes Rev.Swami Adhyatmanandaji Maharaj gave nice discourses, which has inspired and motivated all two hundred officers, who came from different postings of Southern Command. From Poona Swamiji visited Khadakwasla, National Defense Institute, upon the invitation of General Arun Chopra AVSM, PVSM. Rev Sri Swamiji Adhtamanandaji, Sri Marutbhai Dave (Vice President of DJSS and Sivananda Ashram) and yoga teacher Ms.Sangeeta Thawani visited Adipur, Gandhidham and Bhuj area. They attended many programs organized by the Divine Life Society, Adipur. A public meeting was organized at Prabhu Darshan Auditorium of K.C.College, Adipur. About twenty eight organizations join together at a special function organized to felicitate Rev. Swami Adhyatmanandaji Maharaj for his selfless service to the citizens of Adipur, Gandhidham and Kandla District. Swamiji inspired students of Dr. Gajwani B.Ed.Teacher Training School and Dada Dukhayal B.Ed.Teacher Training School by his discourses. Sri Swamiji presided over annual function and prize distribution program of Sadhu Vaswani International School. Swamiji visited Anoopam Mission's house of orphanage, where about seventy children, victims of earthquake 2001 are being cared for. Snack packets were distributed to the children Swamiji presence and his inspiring talk brought joy to the children. During his three days stay at Adipur, Swamiji conducted Prayer, Meditation and Pranayama classes in the morning at the large lawns of Saurabh guest house and evening satsang were arranged at Sri Radheshyam Temple of the Divine Life Society, Adipur. Number of devotees invited Sri Swamiji for home visit also. Swamiji paid a brief visit to prison at Bhuj on the way. Three day Spiritual Retreat was organized at the bank of river Narmada at Malsar. One hundred and seventy five devotees joined the retreat. There were four sessions everyday with Prayer, Meditation, Japa, Gita chanting. Sri Vishnusahasranam Path, Sri Sunderkand Path and discourses by Rev. Sri Swami Adhyatmanandaji Maharaj, Smt.Rupa Majmudar, Dr. C. C. Rawal and Sri Vinayakbhai of Baroda. At the news of Sri Swami Gopalanandaji Maharaj's death, Rev. Swamiji rushed to Mangaleshwar (Bharuch) and attended His last rights. On March 3, 2006 marriage ceremony of Nirav Patni, a grandson of Dr. M. J. Patani saheb ( past acting president of Sri Divyajivan Sanskrutik Sangh – Sivananda Ashram, Ahmedabad) was celebrated at the Ashram. On March 4, 2006 Gayatri Yajna & Paduka Pujan was performed at Dr. Chirag Pandya's home on the occasion of house warming of their new home. On March 5, 2006 a satsang was held on occasion of Beloved Nayanaben Dave's birthday at her home. Rev. Nyanaben wins the hearts of all with her kind, loving and gentle nature. You will always find her engaged in pious activities like making garland for the Deities, doing Japa, serving the guests who come to the Ashram. She is a karmayogi and Bhakta in a real sense. Her Devotion to Guru Maharaj is noticeable in each action of hers . On March 5, 2006 forenoon Sri Swami Adhyatmanandaji and a group of devotees visited 'Manthan' institute for Orphanage, blind, deaf and dumb, mentally retarded and handicapped children at village Kadi. From Kadi entire party of Sri Swamiji Maharaj arrived to Vadavi Sivananda Ashram. A traditional ceremonial reception was accorded to Sri Swamiji Maharaj. Gayatri Yajna was performed, after that Rev.Swamiji spoke at length upon how to receive Grace of Guru in Spiritual path. A grand bhandara (feast) was served to a large number of devotees. On March 7, 2006 there was a large gathering for Sri Sundarkand Path by Sri Ashwinbhai Pathak at the Ashram. On March 9, 2006 Sri Swami Adhyatmanandaji and group of devotees had a short visit at Rajkot for satsang at Dr. Rekha Gosalya's home. 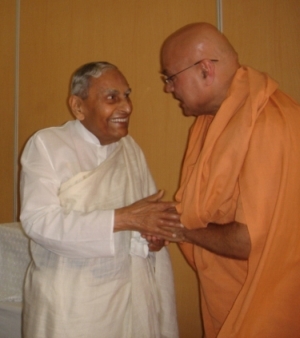 On March 10, 2006 Swamiji started in early hours to Mogri to greet happy birthday to Rev. Sri Jashbhai Sahebji of Sri Anoopam Mission. Upon hearing sad and sudden demise of Rev. Kamala Baa, mother of Sri Sahebji at Mogri, Swamiji rushed to Mogri on his return to Poona. On March 19, 2006 and March 20, 2006 Sri Swamiji visited Adipur second time this month to revive and re launch the functioning of Sivananda Hospital of The Divine Life Society, Adipur. On March 23, 2006 March mid-day Sri Swamiji Maharaj inaugurated "Swarnakala" Ornaments Show room at famous C. G. Road of Ahmedabad. It is own by a Soni brothers who are ardent devotees of Gurumaharaj. 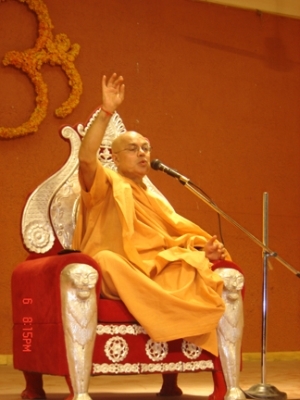 On March 24, 2006 Sivananda Ashram celebrated Rev. Sri Dr. Patani Sahib's 85th birthday at his residence. Prayer was offered by all for his long and healthy life for many more years to serve the mission of mankind of Rev. Gurudev Sri Swami Sivanandaji Maharaj that he has been doing all his life. On March 26, 2006 birthday of baby Amani Shah, daughter of Smt. Resham and Dr.Saurabha Shah was celebrated in a special way by distributing ice cream to thee hundred and eighty two childrens of 'Manthan' home of handicapped, blind and orphanage. Smt. Padmaben Shah, Sri.Marut Dave and other devotees visited 'Manthan' (29 Kms from Ahmedabad) and donated three swings also to these kids. Sri Swamiji left for Bhavnagar for Sri Devi Bhagavat Katha, organized by Sri Gujarat Divyajivan Sangh at Bhavnagar. Regular Yoga classes, temple service and feeding of needy ones are the regular activities of the ashram. Yoga for health, nature cure, and acupressure and homeopath services also serves the needy and poor very regularly. Mrs. Surekha Sonar and Mr. Dhaval conducted Yoga Camp for Army Officials at Babina, Jhansi. Divya Jivan Snagh, Sivananda Ashram, Ahmedabad is pleased to announce upcoming Divya Tour of H. H. Sri Swami Adhyatmanandaji Maharaj to USA, Canada and UK starting from June, 2006. This is in response to the invitations received from few centers namely Troy( Michigan), Atlanta, Toronto (Canada), Winnipeg (Canada), Tampa (Florida) & Chicago. 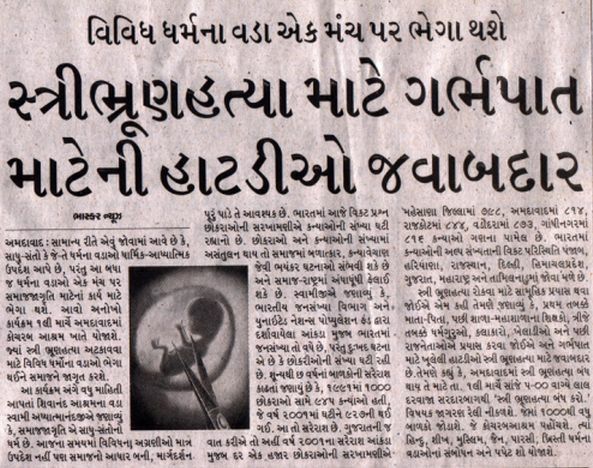 Details are available on "Divya Tour 2006"